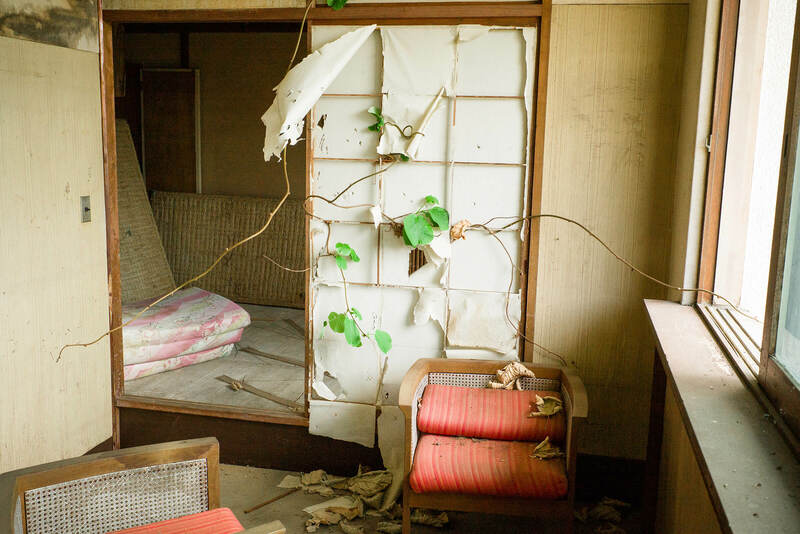 Faded and rundown resort towns are plentiful in Japan; incredibly forlorn looking places that say a lot about the country’s past, and maybe even more about its future. Once populated by scores of couples and young families on short breaks, they are now far quieter, with shuttered up shops hinting at businesses that once were, but almost certainly never will be again. And just as shops and the like suffer, so do hotels, with the inevitable decline in occupancy hitting profits hard; money that in part would have been used to upgrade the rooms and facilities to keep them competitive. 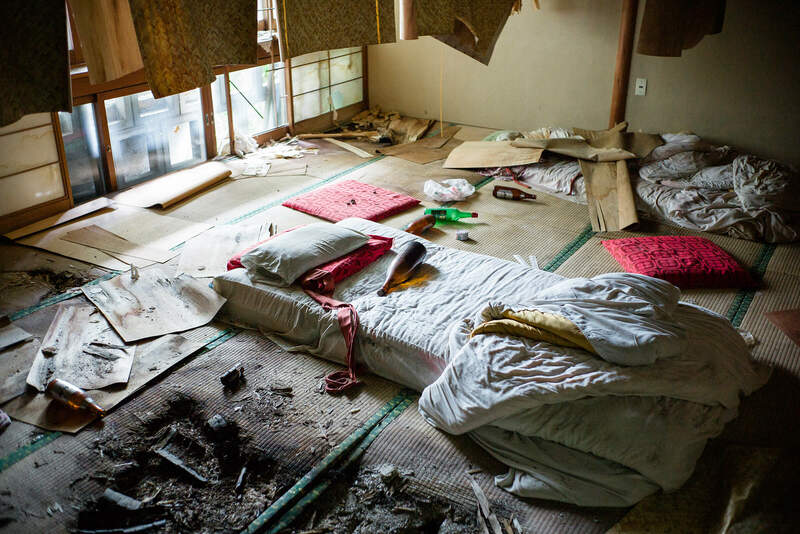 A vicious circle that makes such accommodation increasingly less appealing, which in turn further hits earnings and makes any kind of refurbishment more or less impossible. The inevitable outcome of which is closure. 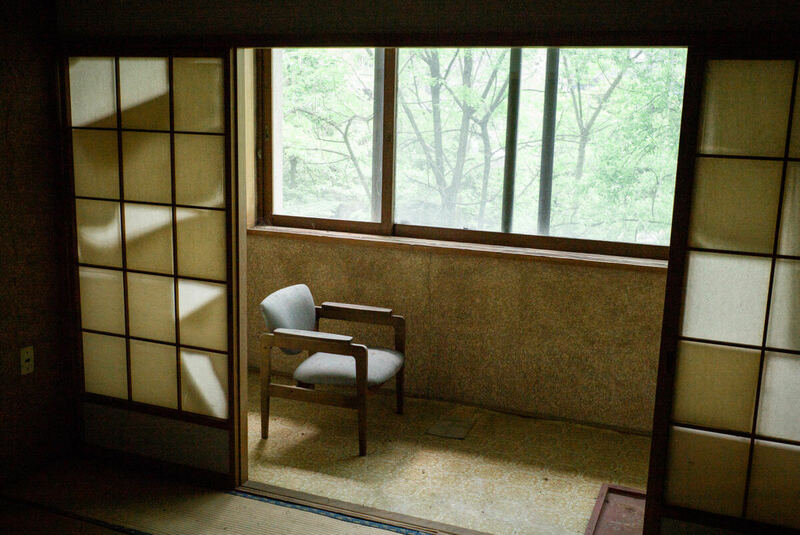 Hotel Omiya closed its doors some time in the early 90s, although rather oddly the final nail in the coffin was apparently a lift accident — the resultant fine proving too much for the presumably ailing business to pay. But even back then the whole building must have been terribly dated, and now, after considerable acts of vandalism and years of exposure to the elements, pretty much any sense of its former grandeur has gone. That said, the aforementioned wanton destruction and weather have resulted in the unexpected beauty of nature beginning to take the place back — a factor that’s very noticeable on the higher floors, with carpets now better described as lush. In more sheltered spots the invasion isn’t anywhere near as pronounced, but the slower process is still just as appealing. 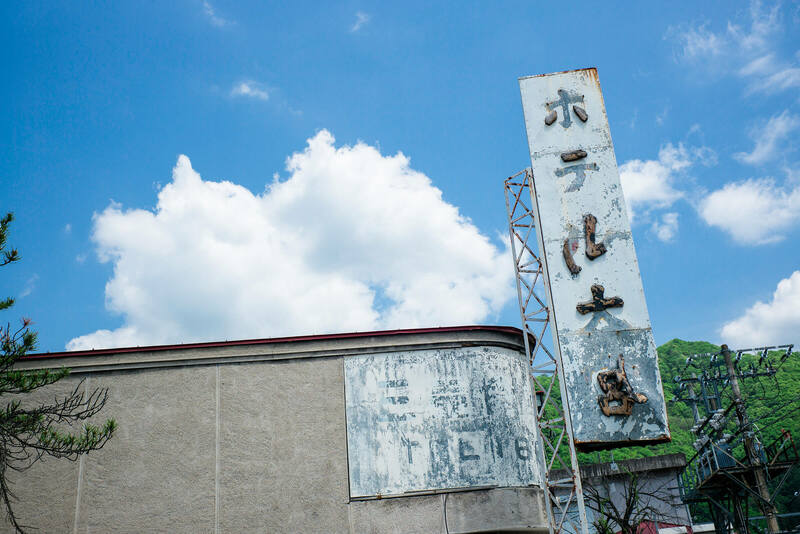 Elsewhere, like so many abandoned structures in Japan, there are left behind signs of former life. Along with a scene that suggests someone was actually living there at some point. For what appeared to be quite a while too. But now — as it has been for most of the last two decades or so — there are no people. No noises either. Just an unnatural, sort of muffled silence, if that makes any sense. Along with the far more common sensation of long lost memories. 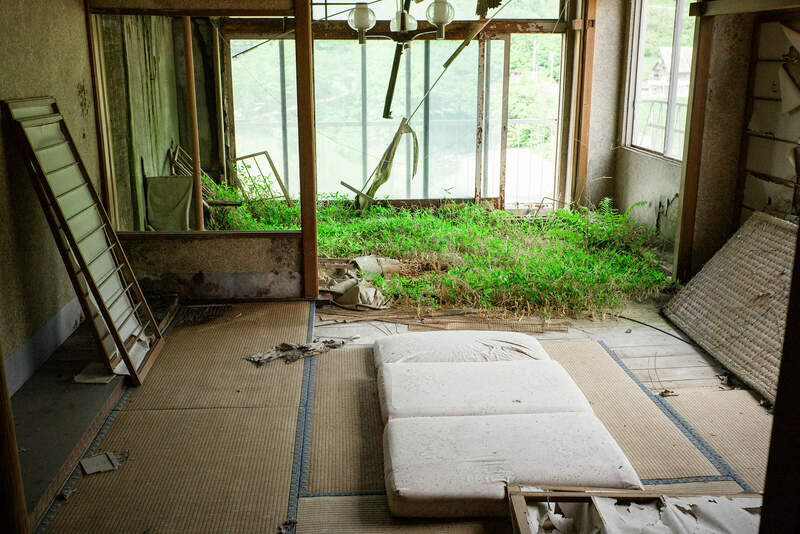 If we considered every economic wave in Japan as a specific spirit of an age those many abandoned places would be the perfect shrine and hide out for them. So it is one more to be filled with the imagery of the faceless/anonymous gods, as in Ghibli’s classic Sen to Chihiro. That’s a very interesting idea. Not sure when this place was built, but there was clearly a hot spring resort ‘boom’ which this was more than likely a part of. I toured Japan for years on motorcycles and in every prefecture I was taken by the number of abandoned restaurants, hotels and other projects that must have been losing bets on a road building to the right or left. That’s how it worked as the railroads developed in the USA. I always chose routes that had become the back roads. They were so much more interesting – and so much less congested. Thank you for an inside look. I never had the time nor temerity to stop for a closer look. Staggering how many there are, isn’t it? A lot are either sealed up or more often than not empty, but thankfully there are still plenty of gems like this one. Interesting you mention the railroads, as this hotel is at a stop missed by the shinkansen, which may well have contributed to its decline. Glad to hear you enjoyed the look inside. I certainly enjoyed exploring it, so good to know other people get something out of the results too. 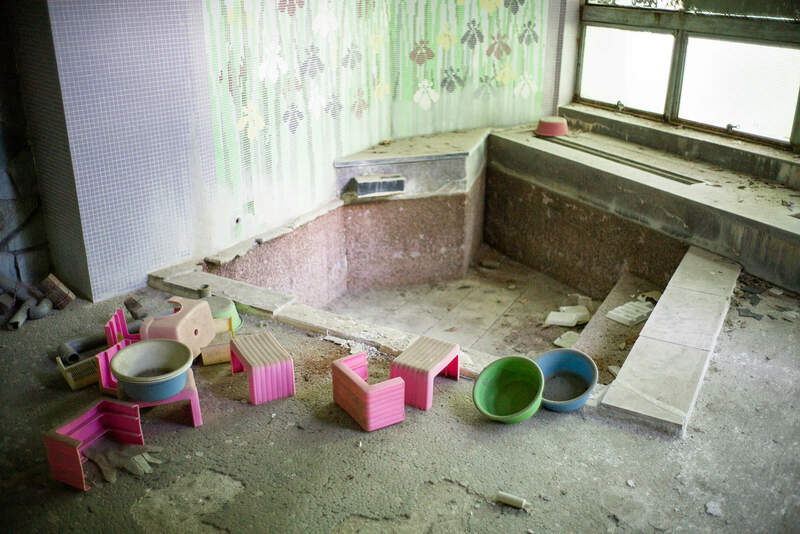 Those are just beautiful photo’s Lee, love when you explore abandoned places. Thank you! The battered entrance and reception weren’t al that encouraging to be honest, but it turned out to be a really interesting place. A tree growing in the corner! 🙂 Great photos. I love the atmosphere! Thanks. Yeah, quite a place. And quite some growth too. You are definitely worrying too much! This one was easy. We simply ducked under a half-hearted barrier at the entrance and we were in. Getting in is very often nice and simple to be honest. Generally speaking such places are either easily accessible, or completely sealed. And once inside, providing you watch where you step, you are totally fine. Definitely worth being a little bold! Thanks. It was good to explore one again. Been a while. Initially it didn’t bode well due to all the damage, but it turned out to be a very interesting find. 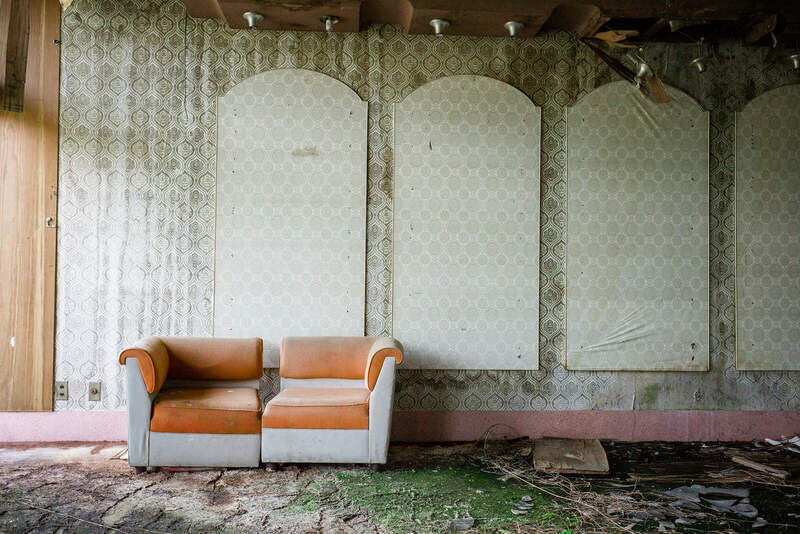 A great set of photographs recording an instant in the slow decay of the hotel. It doesn’t look dusty enough to be that long abandoned. 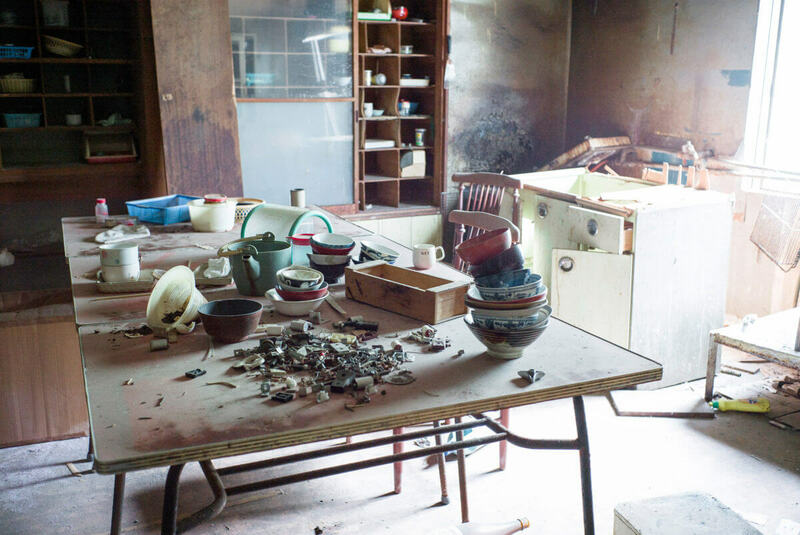 There is more dust and cobwebs in our house after a week than I saw on that kitchen table with it’s odd collection of flourescent light fittings and stack of small bowls. There is immediately another feel when you happen across signs of life in the abandonment, a sudden alertness, and feeling of quite a different form of trespass than the one you were initially willing to commit. Those beds, also, didn’t look too long unoccupied. I’m not sure starting a campfire just there was a good idea. The standout shot for me is hotel4 with its verdant greenery looking for all the world like a miniature forest. 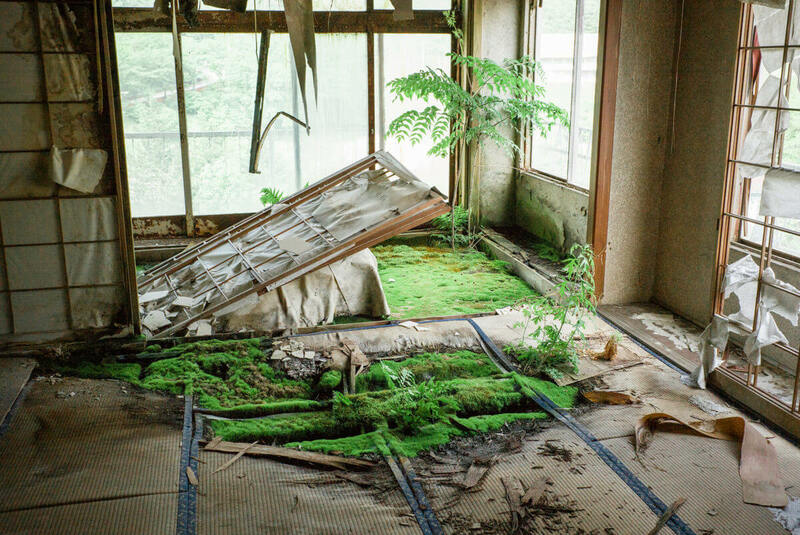 The way the moss is melting its way like alien-blood through the floor would make for a superb timelapse. Interesting how the bathroom looks to have suffered least in the damp and mold department. There just has to be someone’s ghost sitting at the window in that, again, well kept chair – even if it’s just the ghost we imagine there having seen, or been shown, the scene. Hadn’t thought about the lack of dust. 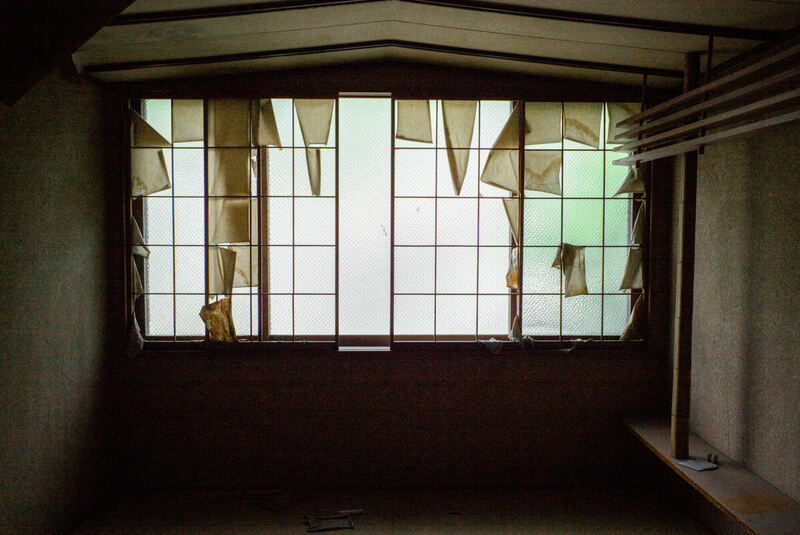 My only guess is that with so many windows being broke, the wind passing through blows it away. The growth in that room is something special, isn’t it? Seeing that when I opened the door was wonderful. A real treat. And yeah, that chair does conjure up such thoughts. A scene for me of incredible quietness. Love the last photo being of one of the likely few “perfect” looking spots left in the place. Great photo story.